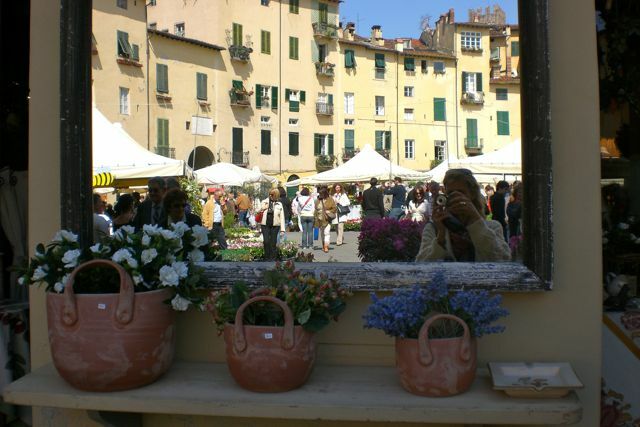 Musings on Italian life in and around Lucca and Bagni di Lucca, Tuscany. 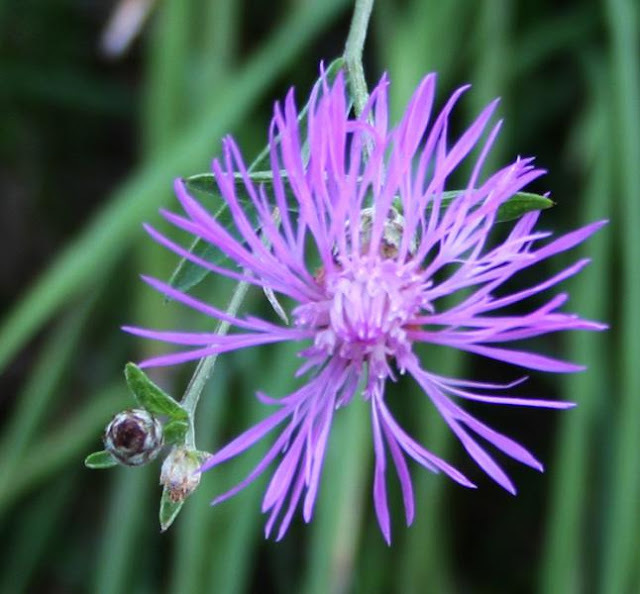 I try to share the most offbeat points of interests in our area and occasionally beyond, and I am also happy to give information and help to travellers. One of the most blissful pastimes on a spring day in Lucca is taking a stroll on the wonderful Renaissance walls, soaking up the warm sun and delighting in following the trail of crocuses. While enjoying my "passeggiata" (walk) I remembered an article written by the Lonely planet in conjunction with the BBC recommending Lucca as one of the best spring destinations for 2011, this certainly also holds good for 2012. The BBC article included this beautiful quote by Hilaire Belloc. ‘The neatest, the regularest, the exactest, the most fly-in-amber town in the world, with its uncrowded streets, its absurd fortifications… everything in Lucca is good’. I also love The Lonely Planet journalist Abigail Hole’s analogy of walking in a medieval manuscript, as indeed one can easily imagine life in a bygone era in this unspoiled, bijou city. I thought it might be useful for travelers if I reposted a day trip to Lucca, which also acts as a good introduction for treasures that can be visited in greater depth. Only recently have travelers started discovering Lucca. The citizens are taking this in good part and are happy to share this jewel that was rated second in Forbes’ list for the best place to live in Europe (2009). You can easily spot a local as they are all immaculately turned out with their designer bags and sunglasses. 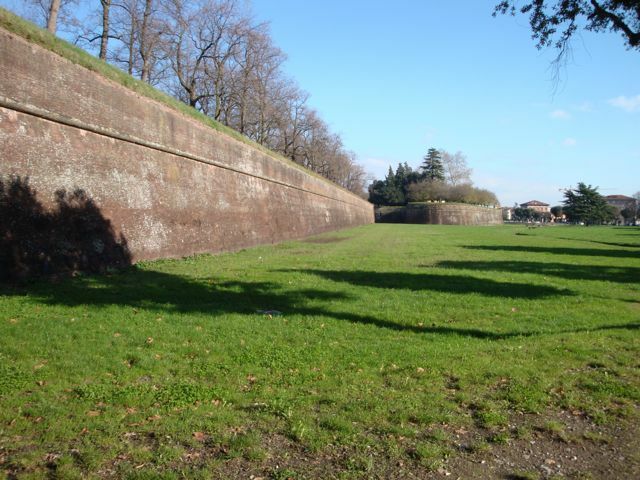 From whichever direction you approach Lucca city, the first thing that strikes you are the massive 16th century walls. I have chosen to start my tour from Porta Santa Maria. In Piazza Santa Maria del Borgo just inside the gate you can dodge the cars vying for parking spaces and pick up maps and further information from the tourist office. Then make your way to the north end of Via Fillungo or the cardo maximus, meaning Roman Main Street that runs from north to south. This is the luxury-shopping zone of the city. Just as the main part of the shopping street starts, your eyes will be arrested by an extraordinary 13th century Byzantine-style mosaic depicting The Ascension on a shimmering gold background. It’s on the façade of The Basilica of San Frediano. The campanile crowned by crenellations seems to add further richness to this structure, started in 1112. It is worth dragging the most reluctant children inside. The 12th century font near the main entrance at the beginning of the south aisle is in the form of a fountain and the marble panels depict the stories of Moses through vivid, busy scenes (I love the one of the Israelites disguised as knights crossing the Red Sea), the good shepherds, and the Apostles. On the wall behind is a wonderful Della Robbia terracotta roundel in need of a good wash.
Don’t miss the entrance to a chapel containing the tiny mummified body of Santa Zita that can be seen through glass, but her missing little toe can’t be seen. It was supposedly broken off and given to a British Bishop as a souvenir. This saint is mentioned in Dante’s (Inferno,XXI, 38). The story goes that Zita was a maid for a local noble family; she was caught stealing bread from the kitchen to give to the poor. When confronted and asked what she was hiding in her apron she replied that it was only flowers. On further investigation it was found that the bread had indeed miraculously turned into flowers. In April the streets are filled with flowers to celebrate her. There is also a wonderful altar and two tombs (1422) by Jacopo della Quercia set into the stone floor. Opposite the chapel of Santa Zita is a chapel delightfully frescoed in 1508-09 by Amico Aspertini, the eccentric and ambidextrous Bolognese painter who, according to Vasari, hung paint pots from his belt while working furiously with both hands. 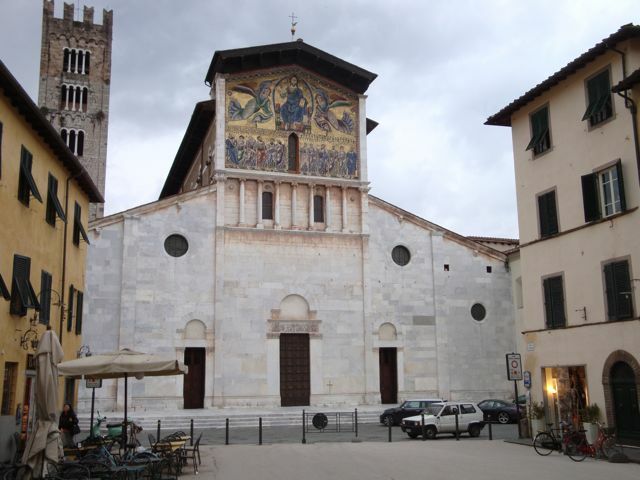 These frescoes include the depiction of the arrival of Volto Santo in Lucca and it is really just a lively picture book. Return to Via Fillungo but don’t get too carried away by window-shopping otherwise you might miss the signs for the Anfiteatro. When you enter what was the arena through one of the original arches, you can imagine it filled with an expectant crowd waiting to jeer at the gladiators. This structure is outside the original ring of walls. It was the theatre of Roman Lucca and held up to 10,000 people. The 55 arches are all still there. Check if you don’t believe me. Like many such structures it was transformed into a fortress during the middle ages. Later, houses were built in the ruins of the original walls and the area was used as a prison and warehouses. At one point there were even vegetable patches in the centre. 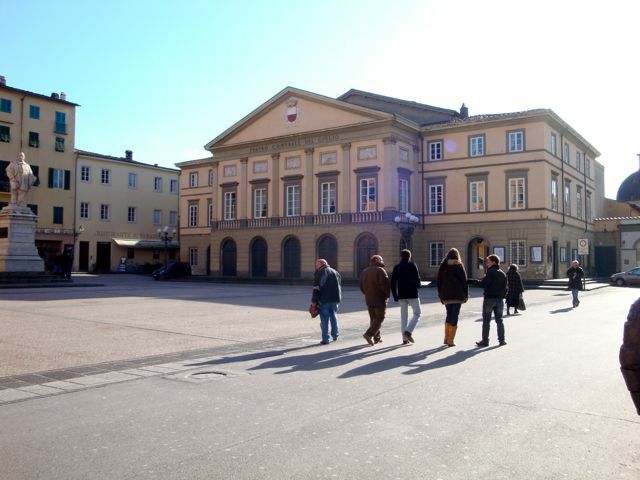 The Anfiteatro was transformed into the beautiful piazza it is today by Lorenzo Nottolini in the late 1800s. The arches are filled with shops and bars. 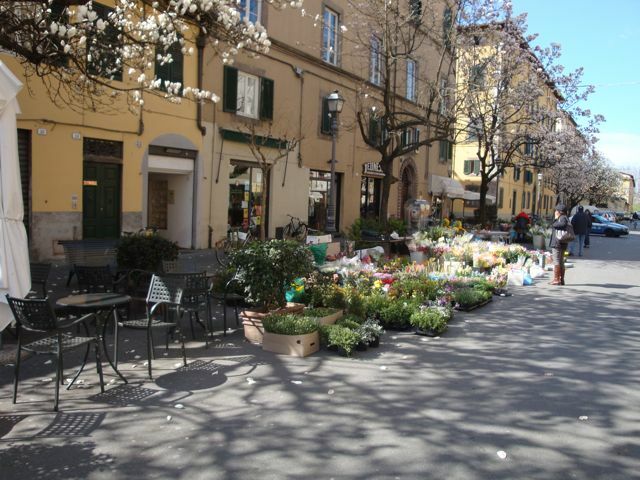 I never miss visiting here at the end of April when there is a flower market held to remember Santa Zita and the piazza in the centre becomes a wonderful riot of colours. A cup of coffee is certainly called for at this point in our tour! Those with gym membership can now tackle the Torre Guinigi with its 230 steps, while the less fit or just plain lazy can either indulge in retail tourism or just enjoy people watching. The Torre Guinigi is part of a palazzo complex that belonged to the Guinigi family who made their money from the silk trade, ruled Lucca and helped defend it from the Medici of Florence. 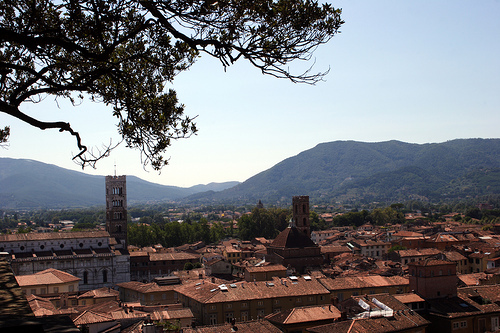 The tower is an icon of Lucca because of the Holm oak trees that grow on its summit. The tower was added to the palazzo in the 14th century to add prestige. The climb is really worth the effort to see the form of the city and its wonderful setting in the middle of a plain protected by hills. Now it is time to complete Via Fillungo not forgetting to notice the Art Nouveau Shop-fronts, the gorgeous 17th century jewelry shop with its wooden shutters and the elegant Antico Caffè di Simo, haunt of Puccini. Now just a bit more culture before a well earned lunch. At the end of Via Fillungo turn right into Via Roma and you will arrive in Piazza San Michele, the site of the old Roman Forum. The palazzi surrounding the piazza are mainly medieval and have been benevolently watching the Lucchesi over the centuries. Still today the piazza is used for heated political discussions and rallies. Visitors often mistake San Michele with the Duomo because all the winding medieval streets seem to lead to this extraordinary church sitting in this large open square right in the heart of the city. The church’s full name, San Michele in Foro, might explain why: foro = forum – this was the forum, the center of the city. 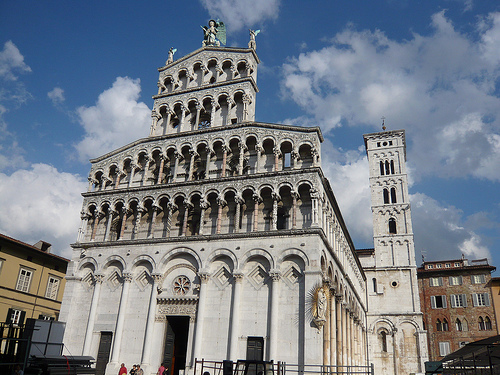 The church itself is a superb example of Pisa/Lucca Romanesque architecture but is in fact unfinished. The columns on the façade are richly decorated; the rose window should have lit the interior instead of being a mere ornament. On the top, the huge bronze statue of the Archangel San Michele slaying the dragon, dominates. He is supposed to have a diamond ring and if after dark you stand in exactly in the right spot in the piazza you can see something shining on his finger. Take a little detour down Via del Poggio and you will come to Corte San Lorenzo and Piazza Cittadella. This is the birthplace of Puccini; a pleasing modern statue records this famous citizen. This is a perfect place to stop for lunch and if you are lucky, someone might be singing Puccini. 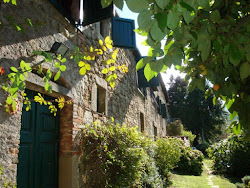 In September 2011 his birthplace should be open again to the public. 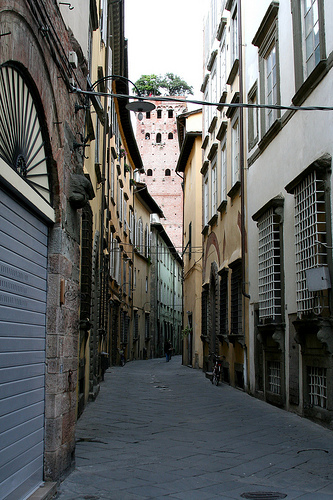 Now while Lucca is taking its siesta why not go up onto the walls either on foot or hire a bicycle. I suggest you start from Porta San Pietro. From Piazza Cittadella go back to Piazza San Michele across Piazza Napoleone and keep going until you come to the walls. These wide low walls were made to resist cannon attacks from the neighbouring state of Florence and were constructed over a period of about 100 years and have 11 bastions many with their guard houses still intact. The bastions contain a maze of passages, which were used as armouries and ammunition stores. Baluardo di San Colombano has two wonderful 13th century lions. By the time the walls were completed they were really redundant. However, they saved the city from being flooded when the River Serchio broke its banks in 1812. Initially trees were planted to help consolidate the structure but they now line this wonderful circular park that is the playground of the Lucchesi from joggers to families to lovers holding hands. From the walls, notice the ornamental Italian gardens of Palazzo Pfanner. Bicycle hire info – there are a couple of hire shops near Porta San Pietro, average hire price is 2.50 € per hour. It is now time to leave your bikes and return to Piazza Napoleone or Piazza Grande, as it is known by the locals. This is where the teenagers hang out on a Saturday afternoon. The Palazzo Ducale dominates the Piazza. In 1805 Elisa Baciocchi, sister of Napoleon Bonaparte, was made princess of Piombino and Lucca, then Grand Duchess of Tuscany. She completely remodeled the interior of the palace that had been partly designed by Bartolomeo Ammannati in 1578 and then enlarged by Filippo Juvarra in 1728. Originally on the site was a huge fortress attributed to Giotto. The palace now houses local government offices though a small section is open to the public and often houses exhibitions. Elisa had two churches and several buildings demolished in front of the palace to create this huge French-style piazza. The idea was to have a statue of Napoleon in the centre but Baciocchi lost her title in 1814 and the present statue is of Maria Luisa daughter of the King of Spain, who also became Princess of Lucca. She refurbished the palace again turning it into one of the finest in Italy. The Piazza del Giglio adjoins Piazza Grande and is the home of the town’s theatre. There has been a theatre on this site since the 1670s. The present building has a neoclassical façade. All Giacomo Puccini’s operas were performed here during his lifetime. Puccini’s ancestors had worked as Maestri di Cappella (Chapel Masters) in the Palazzo Ducale. 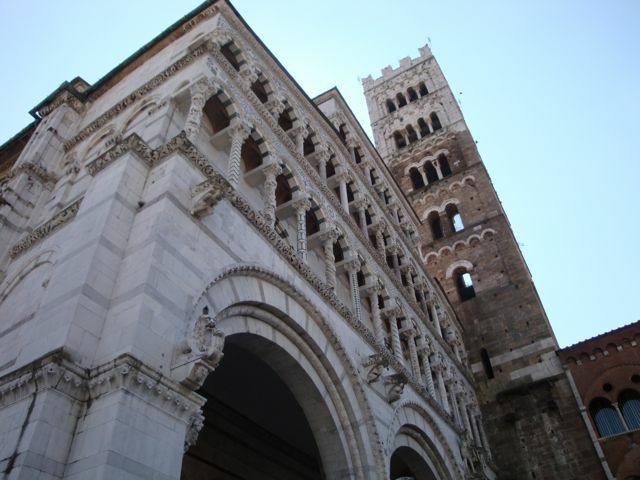 Next, go discover the treasures of the Cattedrale di San Martino. Anselmo da Baggio, who later became Pope Alexander II, started the present Duomo in 1060. The brick base of the Campanile dates back to this period. The upper marble section was begun in 1261. The main west façade is richly decorated in the Pisano-Lucchese Romanesque style but lacks a pediment perhaps due to a financial crisis at the time. The pillars are all different: local legend has it that a contest was held to find the best pillar. The citizens however decided to use all samples therefore saving money and contributing to their reputation of being tight fisted. The other oddity is that the one of the end arches is smaller to accommodate the campanile. The statue of San Martino is a copy and the original can be seen inside the church. Under the portico are the glorious bas-reliefs depicting the story of San Martino and the months of the year. The interior of the cathedral is in the Gothic style. On entering visitors are immediately drawn to the north transept were there is a small temple built by Matteo Civitali in 1482 to house the “Volto Santo” that has history interwoven with legend. It is said that Nicodemus sculpted Christ on the cedar-wood cross to preserve the image. The cross was put on a crewless boat and after many adventures landed in Lucca. The present effigy is a 13th century copy as the 1st century one was destroyed by overzealous pilgrims. Also not to be missed is the sarcophagus of Ilaria del Carretto, second of the three wives of Paolo Guinigi ruler of Lucca, who died in childbirth. The effigy of Ilaria is by Jacopo della Quercia 1407 and it has been said that her face is based on that of his first wife. A dog sits at her feet, a symbol of fidelity and not her favourite pooch. The Last Supper painted by the Venetian Jacopo Tintoretto in 1590 still hangs in its original position. His father was a Lucchese cloth dyer (tintore). Free admission to cathedral. Open Daily 9:30am-5:45pm (to 6:45pm Sat). Ilaria’s tomb in the sacristy: €2 adults. December/New Year – Christmas markets and Puccini New Year Concert. April – Santa Zita flower market and festival. June – Concerts in the city’s piazzas; Biennial Cartasia (art from paper). July – Lucca Summer Festival (pop/rock music); San Paolino Street Festival. September – Settembre Lucchese is dedicated to local tradition and includes the procession of the Luminara di Santa Croce. 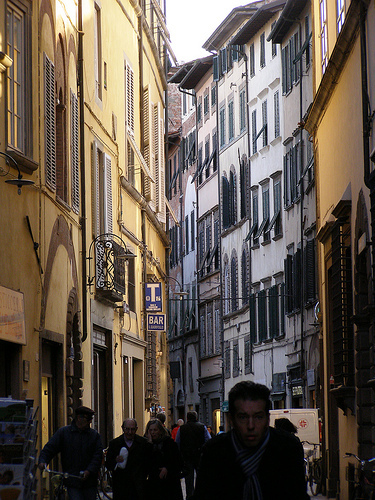 October – Lucca Comics and Games Fair; Lucca Film Festival. November/December – Il Desco Food Festival; Lucca Digital Photo Festival. 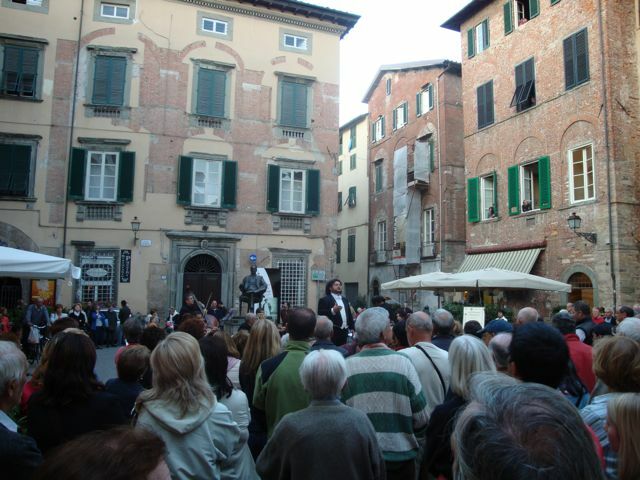 Monthly Antique market On the 3rd Sunday of every month, stalls in the medieval streets and piazzas. Furthermore: Every evening in Lucca there are concerts celebrating Puccini’s music. 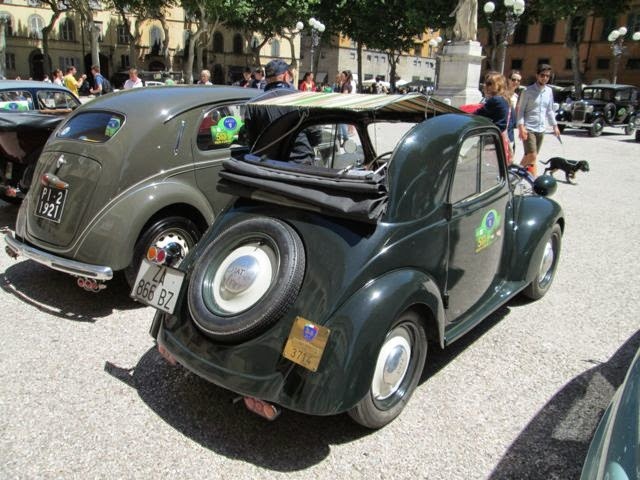 If you are staying outside the city and have a car, leave it in the carpark just outside Porta Santa Maria or try in Piazza Santa Maria del Borgo, if you are lucky enough to find a space. Otherwise follow directions to one of the car parks around the walls and then make your way back to Porta Santa Maria to follow the itinerary. Car access to the old town is very limited and there are cameras. Well thankyou for a wonderful trip down memory lane. I will not tell you just how many years ago it was that we discovered Lucca when we spent our honeymoon nearby. 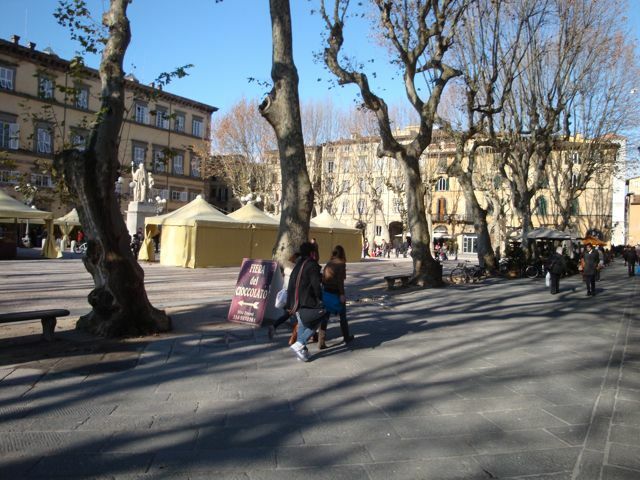 Thank you for taking the time to write about wonderful Lucca. I am off to Lucca very soona dn plan to be married there in September. Do you mind if I use your information to help my wedding guests understand Lucca? My blog is about my love for Italian life. I was born in London but am now part of an Anglo-Italian family and we live in Lucca in Northwestern Tuscany, a very beautiful part of the world with amazing food. I started out as a musician and then became a fine bookbinder and conservator. However, since living in Italy I have worked as a teacher and translator but mainly with tourists and just occasionally dipping my toes back into the world of books and art. Life in Tuscany has bought many challenges and frustrations but also delights. I kick myself sometimes to remind me that I live in the heart of where the Renaissance began.